Android 6.0 saw the introduction of fingerprint authentication, a new security feature that allows users to confirm their identify with a single touch. While this new security feature is most commonly used to secure the user’s lockscreen, fingerprint authentication can also be a useful addition to your apps, allowing you to secure sensitive features such as in-app payments, or replace password-and-username screens with a much more convenient single-touch sign in. In this article, I’m going to show you exactly how to implement fingerprint authentication in your own apps, by walking you through the process of creating a sample app that registers when the user places their fingertip against their device’s touch sensor, processes their input, and then displays a range of toasts depending on whether the fingerprint authentication has succeeded or failed. We’ll also be looking at how to test fingerprint authentication on Android Virtual Devices (AVDs) that don’t feature a physical touch sensor, as well as some best practices to make sure you’re getting the most out of this new feature. It’s a quick and convenient way of authenticating the user’s identity. While a traditional PIN, pattern or password is an effective security feature, there’s no denying that requiring the user to input a password does add some friction to the user experience. Touching your fingertip to a sensor is far easier than entering a PIN, pattern or password, making fingerprint authentication an effective way of striking a balance between keeping your users safe and providing a frictionless user experience. You can’t forget a fingerprint! Most of us have a long list of passwords we need to remember on a day-to-day basis. Plus, if you follow best practices for creating secure passwords (never use the same password more than once; always use a combination of symbols, numbers, plus upper and lower case characters) then chances are these passwords aren’t particularly easy to remember! Fingerprint authentication can provide your users with all the security of a password, without actually adding to the list of passwords they need to remember on a day-to-day basis. No more struggling with mobile keyboards. Not only are long, complex passwords difficult to remember, they’re also difficult to type on the smaller screen of a mobile device. Even if your app only requests the user’s password once per session, navigating the awkward mobile keyboard can make this feel like one time too many. Also, consider that many mobile users interact with their apps on the go – and no-one wants to be messing around trying to type out a long, complex password when they’re stood up on a busy commuter bus! Fingerprint authentication gives users a way of confirming their identity without them having to go anywhere near the mobile keyboard. No more annoying password recovery or reset. There’s never a good time to forget your password, but forgetting a password for a mobile app can be particularly painful as users tend to interact with mobile apps on the go. If you’re out and about then the last thing you want to do is sit down and navigate an app’s password recovery or reset procedure. By adding fingerprint authentication to your app, you can ensure that your users never have to see your app’s password recovery or reset screens again. Your fingerprint is unique and impossible to guess. Even if your users follow best practices for creating a secure password, there’s no guarantee that someone won’t be able to guess their password anyway, or even manipulate the user’s device into leaking their password via tools such as spyware. While nothing is ever 100% secure, a fingerprint cannot be guessed or stolen in the same way a password can. If you’ve weighed up everything that fingerprint authentication has to offer and have decided that it’s something you want to start using in your apps, then there’s a few steps you’ll need to complete. The most effective way of familiarizing yourself with these steps is to see them in action, so let’s create a sample app that’s capable of performing fingerprint authentication. Open Android Studio and create a new project. You can use the settings of your choice, but for the sake of simplicity you may want to set your project’s minimum SDK to 23 or higher. This ensures your app is never installed on a device running a version of Android that pre-dates fingerprint authentication. If you do allow users to install your app on pre-Marshmallow versions of Android, then your app will need to verify what version of Android it’s on, and then disable its fingerprint-related features where appropriate. Once you’ve created your project, we’ll need to make some adjustments to the Manifest and build the app’s user interface. Our app is going to require access to the device’s touch sensor in order to receive fingertip touch events. However, the Android operating system runs on a wide range of devices, and not every one of these devices includes a touch sensor. When you mark a feature as android:required=”true,” the Google Play store will only allow users to install your app on devices that fulfil all of these hardware requirements. Google Play will then permit users to download your app even if their device doesn’t have a fingerprint sensor. If you do opt for this approach, then your app will need to check for the presence of a touch sensor at runtime and then disable its fingerprint authentication features, where appropriate. While it may seem strange to declare a feature in your Manifest just so you can state that your app doesn’t actually need it, declaring every feature your app uses will help to ensure you don’t get caught out by implicit hardware requests. Google provides a standard fingerprint icon that they recommend you display whenever your app requests fingerprint authentication from the user, so download this icon and add it to your project’s ‘Drawable’ folder. Now it’s time to implement the fingerprint authentication part of our app. We’re going to be performing the bulk of the fingerprint authentication in our MainActivity.java file, so I’m going to look at this file in two parts. In the first half, we’re going to focus on checking that the device has the hardware, software and settings required to support fingerprint authentication, and in the second half we’re going to create the key, cipher and CryptoObject that we’ll use to perform the actual authentication. The device is running Android 6.0 or higher. If your project’s minSdkversion is 23 or higher, then you won’t need to perform this check. The device features a fingerprint sensor. If you marked android.hardware.fingerprint as something that your app requires (android:required=”true”) then you don’t need to perform this check. The user has granted your app permission to access the fingerprint sensor. The user has protected their lockscreen. Fingerprints can only be registered once the user has secured their lockscreen with either a PIN, pattern or password, so you’ll need to ensure the lockscreen is secure before proceeding. If any of the above requirements aren’t met, then your app should gracefully disable all features that rely on fingerprint authentication and explain why the user cannot access these features. You may also want to provide the user with an alternative method of confirming their identity, for example by giving them the option to create a password and username. In addition to completing these tasks, I’m also going to create an instance of FingerprintManager. This is a class that we’ll be using throughout the fingerprint authentication process, which is why it makes sense to establish it early in our MainActivity file. If all of these conditions are met, then your app is ready to start the fingerprint authentication process. Gain access to the Android keystore, by generating a Keystore instance. The Android keystore allows you to store cryptographic keys in a way that makes them more difficult to extract from the device. The keystore also restricts how and when each key can be used. To create that fingerprint authentication effect, you just need to specify that the user has to authenticate their identity with a fingerprint every time the want to use this key. Create a new method (I’m going to use generateKey) that’ll be responsible for generating the app’s encryption key. Use the generateKey function to generate the app’s encryption key. Create a new method (I’m using initCipher) that we’ll use to initialize the cipher. Use the Cipher instance to create an encrypted CryptoObject instance. Assign the CryptoObject to the instantiated FingerprintManager. Our final task is creating the helper class that we referenced in our MainActivity file. This class will be responsible for triggering the authentication method and processing the various callback events that can occur depending on whether the authentication has succeeded, failed, or an error has occurred. //I’m going to display the results of fingerprint authentication as a series of toasts. Assuming that you have access to a physical smartphone or tablet that’s running Android 6.0 or higher and features a fingerprint sensor, testing our sample app on a physical Android device should be fairly straightforward. First, make sure your Android smartphone or tablet is configured to support fingerprint authentication by securing your lockscreen with a PIN, password or pattern and then registering at least one fingerprint on your device. Typically, you register a fingerprint by opening your device’s ‘Settings’ app, selecting ‘Security > Fingerprint,’ and then following the onscreen instructions. Install and launch the sample app on your device, then put it to the test by placing your fingertip against your device’s fingerprint sensor. The app will then display various toasts depending on whether the authentication succeeds, fails, or an error has occurred. Spend some time making sure the app is reacting to each event correctly. When it comes to testing Android’s fingerprint authentication on an AVD, there’s an immediate problem: an emulated Android device doesn’t have any physical hardware. 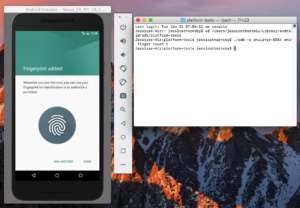 However, AVDs are a crucial tool for testing Android apps across a wide range of different hardware and software, so you’ll need to find a way to test fingerprint authentication on an AVD. The solution, is to use Android Debug Bridge (ADB) commands to fake a touch event. Open your Mac’s Terminal (or Command Prompt if you’re a Windows user) then change directory (cd) so it’s pointing at your Android SDK download; specifically, the Android/sdk/platform-tools folder. Once your Terminal pointing in the right direction, create and launch the AVD you want to use, then install your app on this AVD. Launch our sample app and re-enter this command into your Terminal, and the AVD will act as though you’ve placed a registered fingerprint against the device’s non-existent fingerprint sensor. Consider backwards compatibility. Fingerprint authentication didn’t find its way into the Android platform until version 6.0. While it does have plenty to offer and can greatly improve the user experience, chances are you’re not wild about the idea of creating an app that’s incompatible with every Android device running Lollipop or earlier! We’ve already explored using Build.VERSION checks and @TargetApi annotations to include fingerprint authentication in your app while remaining backwards compatible with earlier versions of Android. However, you can also use the v4 support library, which provides compatibility version of many of the fingerprint classes introduced in Marshmallow. If you do use this library, then when your app is installed on Lollipop or earlier it’ll behave as though the device doesn’t feature a fingerprint sensor – and overlook the fact that the operating system is incapable of supporting fingerprint authentication. Provide alternate methods of authentication. There are a number of reasons why the user might be unable to use your app’s fingerprint authentication. Maybe they’re running a pre-Marshmallow version of Android, maybe their device doesn’t include a fingerprint sensor, or maybe they haven’t configured their device to support fingerprint authentication. However there may also be some users who simply don’t want to use fingerprint authentication – some people may simply prefer to use a traditional password. In order to provide the best possible experience for all your users, you should consider providing an alternate method of authentication for users who are unable or unwilling to use your app’s fingerprint authentication. Clearly indicate when your app is “listening” for user input. Don’t leave the user wondering whether they’re supposed to press their finger to the sensor now, or wait for further instructions. Google recommends that you display the standard fingerprint icon whenever you app is ready to receive a touch event, but depending on the context and your target audience you may want to consider supplementing this icon with clear text instructions – which is exactly what we’re doing with our sample app’s “instructions” string. If the device cannot support finger authentication, then explain why. There’s a list of requirements that a device needs to meet before it can support fingerprint authentication. If the device doesn’t fulfil one or more of these requirements then you should disable all of your app’s fingerprint features, but disabling sections of your app without providing an explanation is never a good idea! Best case scenario, you’ll leave the user wondering what they’ve done wrong – worst case scenario, they’ll assume that your app is broken and leave you a negative review on Google Play. You should always let the user know why they can’t access part of your app and, ideally, provide them with instructions on how they can ‘unlock’ this part of your app’s functionality. Provide the user with plenty of feedback. Whenever the user touches their device’s fingerprint sensor, the authentication can succeed, fail or an error can occur – and you should never leave your users wondering which one has just happened! Imagine you press your fingertip to your device’s touch sensor when prompted, and nothing happens. What went wrong? Maybe some dirt on the sensor interfered with the authentication process; maybe you didn’t press on the sensor long enough, or maybe the app is broken and you should give it a negative review on Google Play immediately? To ensure your users can navigate your app’s fingerprint authentication successfully, use the fingerprint authentication callback methods to provide the user with all the information they need to understand when authentication has failed, and why. In this article we looked at the steps you’ll typically need to complete in order to add fingerprint authentication functionality to your apps – if you want to try this project for yourself, then you’ll find the complete code on GitHub. There’s a wide range of ways that you can use this kind of single-touch identification to improve the user experience – from adding an extra layer of security to your in-app payments, to providing an easy way to lock and unlock sensitive areas of your app, or even removing the need for users to their and password every time they want to use your app. If you have any plans to use fingerprint authentication in your projects, then let us know in the comments!